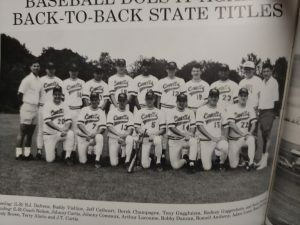 The 1990 and 1991 3A State Champion baseball team will be honored Saturday afternoon. There will be short recognition ceremony beginning at approximately 1:45, just before the baseball team’s first pitch against Shaw at 2:00. The 1990 team won the school’s second baseball state championship with the 1991 team winning the school’s third. Also, obviously, it was the first time in school history that the baseball team won “back to back” state titles. Please come out at support the Patriot teams of the past, as well as the current Patriot baseball team!